We all know the story. God compels Moses to go before Pharaoh and ask for the release of the Israelites. Pharaoh resists. Plagues ensue. Pharaoh eventually relents and Moses leads the people out of Egypt. Notice that the Egyptians are not happy about losing their slave labor. So Pharaoh leads his army forth to recapture what he believes is rightfully his. God has other plans. God delivers his people from the Egyptians. In the end, Pharaohs army is wiped out in the Red Sea. 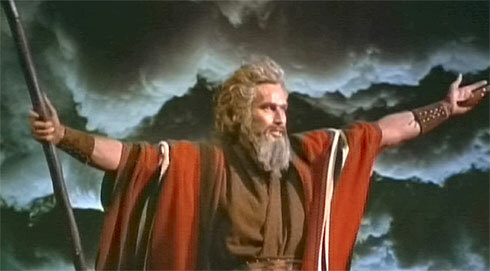 Like I was going to have a post about Moses parting the Red Sea and not include Mr. Charlton Heston. This morning, my Sunday school class started a new series on fear and anxiety. My teacher pointed out the difference between the Israelites’ response (they thought they were going to be whole sale slaughtered) and the Egyptians’ response (they wanted their slave labor back). Fear often causes us to believe things that are simply not true. Fear: I am going to lose my job and never find one again. Truth: I have job security due to my position and even if that isn’t true, I will be able to find another job due to my degree and experience. Just want to encourage you today to kick fear in the face. Start by realizing that sometimes the things that we hear whispered in our heads are lies. So write them down. Capture them. Confront them with the truth. We can do this. Kick fear in the face. Hm, I can do that.